This post answers those two questions. We have found that even for people with a strong background in traditional file sharing, the document sharing in Google can be a bit confusing. The three steps below will establish a secure environment in Google documents for sharing corporate documents with team and sub-teams within your organization. This is the Google App account that will own all the important corporate documents inside Google Docs. Normally it is the business owner’s account, but it could be a separate account setup in Google Docs for this purpose that only trusted persons have access to. The settings shown above illustrate the Leaders folder. With these settings Jonathan or Kazmeen can now place a document he created into this shared folder, and all 3 people will be able to view and edit it. You’ll notice that I’m not recommending to share this with a Group, that I’ve shared the folder with individual accounts. This approach has the important benefit that Jonathan and Kazmeen will see this folder in their Google document view under “Shared with Me”. Unfortunately, when you share with a Group, group members to do see the folders or documents you have shared in their Google Doc view until after they have opened them. That might be a good idea, but people who are familiar with network file systems find it really confusing which is why I am recommending sharing with individual user accounts. Google also has this article published on folder sharing, which provides additional details. Finally, it is important to retain ownership of important corporate documents inside this trusted account from step 1. This should save you from two events: a) an employee maliciously or accidentally deletes a document or b) a document is a deleted when the employee moves on and their account is removed. If the trusted account owner does not own an important doc, the ownership is easily transferred: from the Share setting on any document, the current owner simply needs to change the document to be owned by the trusted account as pictured below. These three steps will allow you to safely and efficiently share and manage a large set of documents in your organization. 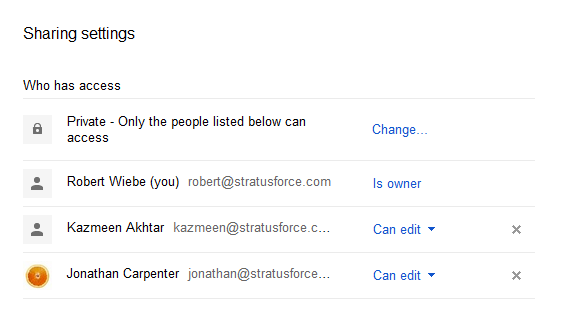 This entry was posted in Google Apps, Information Security on November 14, 2011 by robert@stratusforce.com.